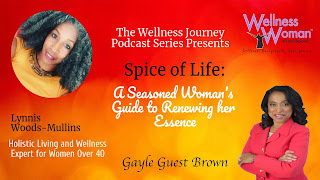 On the Wellness Journey Podcast Series - Spice of Life A Seasoned Woman's Guide To Renewing Her Essence, I had the good fortune to be able to interview Gayel Guest- Brown. Gayle Guest-Brown is the author of Girl Get it Right! an I.M.P.A.C.T. guide to creating the life and work you dream of. She is an Executive Leadership Coach, leadership trainer, and keynote speaker. Gayle is a certified professional coach (CPC), empowering leaders to access their strengths, connect to their values and reach their best strategies through one-on-one confidential and customized leadership coaching. In our interview, we discussed the importance of recognizing our strengths and leveraging them to move us forward to success. too many time in mid-life women begins to think they don't have as much to offer. That couldn't be further from the truth. We have much to offer and our experience is valuable. Tune while Gayle Guest-Brown and I talk about success in mid-life.